Part 2 of the Infamous Documentary! Prepare to be corrupted and depraved once more by the sequel to the definitive guide to the Video Nasties phenomenon – the most extraordinary and scandalous era in the history of British film. For the first time ever on DVD, all 82 films that fell foul of the Director of Public Prosecutions “Section 3” list are trailer-featured with specially filmed intros for each title, alongside director Jake West’s brand new documentary – VIDEO NASTIES: DRACONIAN DAYS. 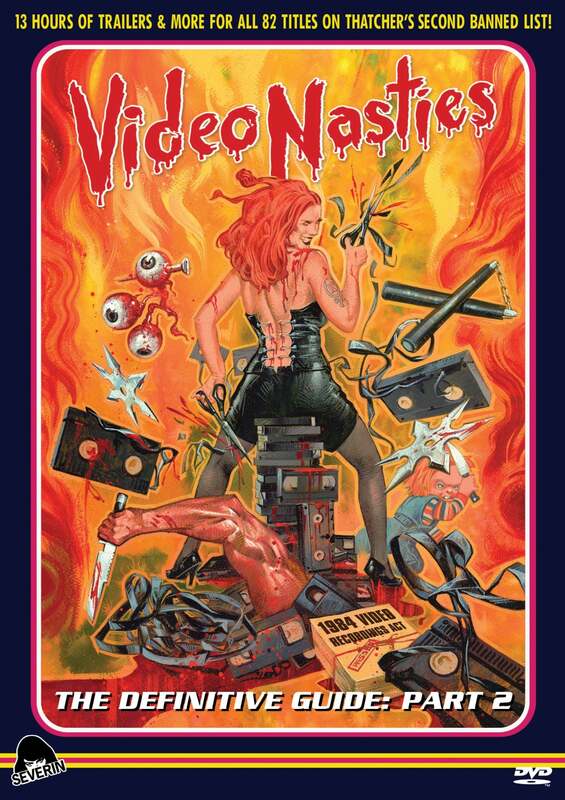 The critically acclaimed follow-up documentary to VIDEO NASTIES: MORAL PANIC, CENSORSHIP AND VIDEOTAPE from director Jake West and producer Marc Morris who continue to uncover the shocking story of home entertainment following the introduction of the 1984 Video Recordings Act. The UK was plunged into a new Dark Age of the most restrictive censorship, where the horror movie became the bloody eviscerated victim of continuing dread created by self-aggrandizing moral guardians, and the film charts the consequences of this, including subversive social culture that sprung up around it. With fascinating interviews and more jaw dropping archive footage, get ready to reflect and rejoice on the passing of a turbulent time. Original trailers for all 82 titles that were designated under “Section 3” of the Obscene Publications Act by the Director of Public Prosecutions. These titles were liable for seizure and forfeiture by the police, removed from sale or hire and then destroyed; although they were not ultimately prosecuted. This amazing list was discovered whilst researching legal paperwork for the original VIDEO NASTIES: THE DEFINITIVE GUIDE and finally clears up why so many additional titles were historically considered to be “Video Nasties”. Titles include: Blood Lust, Brutes and Savages, Cannibals, Dead Kids, Deep Red, Death Weekend, Demented, Eaten Alive, Headless Eyes, Hell Prison, Love Butcher, Mark of the Devil, Massacre Mansion, Savage Terror, Scream for Vengeance, Suicide Cult, The Texas Chain Saw Massacre, Xtro and Zombie Holocaust.